We do a good deal of business beyond these listed areas with delivery help from UPS. Robert S. Coats founded Coats Printing Company in 1910 in the 1900 block of Eye Street, Bakersfield, California. In 1912, plans were formulated for a new building at 2020 Eye Street and in 1914 the young business relocated to the street front portion of the two-story building for what turned out to be a long stay. In 1921, Henry Fultz, a farm boy from Kansas, moved to Bakersfield and went to work as a helper for his uncle Bob. By the time Coats passed away in 1932, Henry was foreman of the print shop and shortly thereafter formed Kern Printing Co., Inc. in a partnership with Robert S. Coats Jr., son of the founder. After surviving the depression and the Second World War, Henry Fultz, Jr. returned from the service to join the firm in 1945. By this time they occupied the entire ground floor of the building with a hotel above the plant and dry goods storage in the basement. 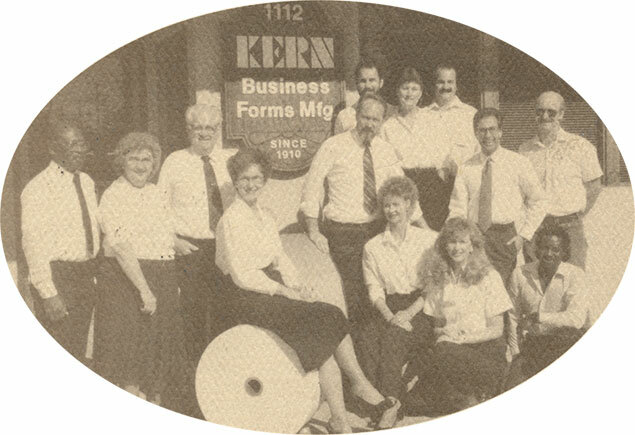 Following the war, several printing shops were founded in Bakersfield, and Kern Printing began to look toward a printing specialty to establish their niche in the growing county of Kern. Business forms were the right answer. The late forties introduced a higher degree of mechanization to the printing industry. Kern Printing installed one of the first fully integrated, web-fed business form presses designed by Orville Dutro, a genius designer responsible for developing the basis for today’s press configurations. In the early sixties another web press, and soon one of the first mechanized forms collation equipment was added. The late sixties was a time of transition due the death of Robert Coats, Jr. followed by, Henry Fultz, Sr. In 1969, Henry Fultz, Jr. assumed the sole leadership of the firm and was joined by his son, Gary. The early seventies again moved the firm into more mechanized equipment and as a result we out-grew all three levels at the Eye Street location. In 1976, the plant was moved to its present location, 1112 – 14th Street at which point the firm became known as Kern Business Forms Manufacturing. Further growth during the eighties, brought in additional family members to keep up with the installation and operation of a seemingly continuous stream of equipment upgrades throughout the plant and offices. In the years since, we continue to kept up with the changes in the industry. We still have the big traditional printing presses which are now complimented with modern computer driven pre-press support. Just as prevalent in today’s times are the electronic work-flow and production. Along with our traditional printing presses, digital pre-press and production are the latest-and-greatest production avenues that continually bolster our operational quiver. Since 2001 several local print firms merged with us and in 2012 we brought them all under the new name, Kern Print Services. Today, Gary Fultz and his brother-in-law Ronald Chapman along with a dedicated staff of 22, guide the firm into the future as we keep pace with the fast growing needs of the industry.